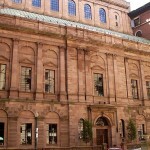 Built in 1903, the historic theater is said to be haunted by a former mayor of Boston who died during a performance, a little girl, and a married couple wearing turn-of-the-20th-century clothing. Used to work here. If I had a dime for every patron who reported seeing a man dressed in a suit and hat in the balcony lobby…Id be a rich man. Though the deceased mayor theory has been de-bunked (a fairly quick google/wikipedia session will show you no mayor has ever died at the Majestic). There is supposedly a little girl whom co-workers have heard whispering “Hello?” sounding lost. There is also an opera singer who has been heard singing an aria from the stage, only to have the song suddenly stop when you get close.